Ella had her 4 week check up on Tuesday. It was a huge deal for us for a few reasons.... 1. She HAD to gain weight at this appointment or we were back to more dr's and tests... 2. Mike and I were sure that this was the big appointment, the one where we would hear all the things that we were going to be different because Ella has Down syndrome. 1. She gained 7 ounces!! Yeah!! I have never been so excited to see weight gain in my life. Her goal was 7 ounces and she did it! Not an over-acheiver, but thats OK, she did just what we asked of her and that's all that mattered. 2. After the big weight gain excitement, I was ready for the "talk". I was sure Dr. Sudha would sit us down and tell us all the things that we would find different about Ella in this next month. She didn't do that... I thought maybe she forgot to bring it up. I asked her what we should be looking for with Ella and her having Down syndrome and if there was anything we need to do differently. She looked at me, said - Nope - and went on talking to us about tummy time and RSV warning signs. I didn't want to dwell on the Down syndrome question, but I asked her again if we should be doing anything different or if Ella would be doing anything different. She told me no again and basically told us to love her and feed her and play with her and that is it. She is just a normal baby..
1. Gone out to eat with her mom and dad who were dying to get out of the house after a long time on bed rest. 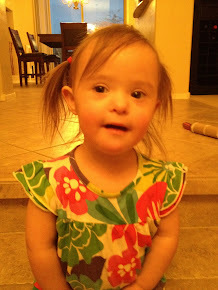 I know that the challenges of having Down syndrome will come eventually and that just makes me a nervous wreck. I wish Down syndrome had a timeline that I could reference to know what to expect and when to expect it, but it doesn't. She could walk on time or she couldn't. She could say her first word right on schedule or it might take her an extra month, or year, we just don't know. This is what is no fun. I am the type of person who likes to control everything. I know we will be putting her in physical, occupational and feeding therapies to be proactive with her development, but god, do I wish I knew which areas of development she would need the most help in. I am sure as she grows we will be figuring it all out, but right now I feel like I can't focus my energy on the things that she will really need, I just read about EVERYTHING that might go wrong and make myself a nervous wreck. I am learning to be different though, trying hard to just slow down, live one day at a time and just worry about what I can control right now. It's not easy, but I am working on it! Not much else to report. It's spring break here in Phoenix, so the boys are home this week and having a blast making the house a mess and annoying Mom. I am having a blast with them too. I love feeding Ella while the boys sit with me and tell me stories and try to get me to laugh with their newest knock knock jokes. It is just a perfect way to spend a few minutes a day... Me, my boys and my baby. Liz, I am Stephanie, a friend of Erin's. I am absolutely blown away by your ability to write so freely. You are an amazing mother and your baby Ella is beautiful! I do find it so coincidental how certain people show up in your life right when you need them... I do believe it is no coincidence, but an act of God or whatever name you would like to call it. I just wanted you to know that you are an inspiration to others, and please continue to write...you have a wonderful talent! just wanted to say you write beautifully--thanks for sharing your story, and those pictures of your precious little girl! by the way, i remember sharing so many of the feelings you've expressed right after my daughter was born. she turned 2 today, and every day has actually gotten easier, not harder. sure, she has some delays, but mostly, we just celebrate every milestone and love getting to know her wonderful personality. it's such a journey, and i'm so grateful for my little girl.